Early in July 1995, a severely agitated and depressed young woman came into my office. She complained that she was experiencing visual and auditory hallucinations, the voices coming from outside of her head. A few days before, she had been seen in the Emergency of the hospital and was diagnosed as borderline personality disorder. The night before she saw me, she "flipped out" and began to break up the furniture in her apartment. Thirty minutes later she ran from her apartment to seek help, and she decided she would not go back until she was better. She had all the classical symptoms and signs of schizophrenia, including hearing voices and seeing visions. The voices laughed at her. She showed her husband where the visions were, and asked if he could see and hear them. It was like looking at a TV box hung in the air with a person's face, usually a woman's, on the screen. The world was very unreal. She was delusional, paranoid, had thought blocking, and her memory and concentration were very poor. She was disturbed by the hostile ideas. I started her on niacin 1 gram tid, ascorbic acid 1 g tid, Mycostatin (1) 1.5 mcg. tid, and Neuleptil (2) 10 mg hs. At the next visit I changed the drug to Etrafon D (3), 2 at bedtime. September 25, 1995 she told me she had gone off the program for six weeks and her symptoms returned four days before the interview. She resumed the regimen. October 23, 1995, she was much better and had gone back to work. She was now on niacin 2 g tid and folic acid 5 mg tid. December 7, 1995 she was normal. 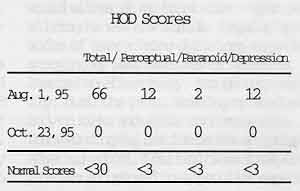 The HOD Test (4) is a diagnostic aid for schizophrenia. The higher the scores, the greater the probability the disease is present. This patient had the following scores. The average score for schizophrenics, obtained from several thousand tests, is around 65. Scores for all other diagnostic groups, excluding patients with delirium, are under 30, and most normal subjects score less than 15. As the patient improves, the scores decrease. The test is a diagnostic aid and also helps to determine whether or not improvement is occuring. Decreasing scores with repeated tests shows that the patient is improving, while rising scores show they are getting worse. Patients have a right to be given the most accurate diagnosis, because their lives will surely depend upon that.There is an increasing tendency for psychiatrists to avoid diagnosing schizophrenia. This reminds me of the state of diagnosis before 1960 when it was considered a breach of ethics to tell patients that they had schizophrenia. Today, this has been replaced by the avoidence of the diagnosis altogether, unless that person fits some stereotype of the chronic schizophenic. Usually a combination of thought disorder and perceptual disturbances such as voices and visions is enough to make the diagnosis. But this has been replaced by two other terms, one being bipolar, because this allows the psychiatrist to use lithium. They consider that the response to lithium is proof that the bipolar disorder was present, and ignore all the perceptual changes which schizophrenics have. If they complain of depression they are lumped in with the mood disorders. The second habit - more and more common - is to call them BPD. This has the advantage that they no longer have to be treated, since no one expects that a personality disorder can be treated with medication. The following is the patient's account of her illness prepared in November and December, 1995. The warning signals were evident by age 14. 'Early sexual abuse' and 'inadequate parenting' were cited as precipitators of the symptoms (I certainly dispute both as possibilities). Nightmares, vague fears and insecurities were what I reported to various counsellors and one psychologist. As time passed, I was able to be more specific in my expressions. I feared best friends were aliens and I anxiously awaited evidence of their traitorship. I had an enemy - a man, tall, heavy set, his face cast with shadow. Only I saw him tower above me, wielding a knife, threatening. When I did not see him, I otherwise sensed his presence; felt his arm brush my sleeve, heard his footsteps trace my path. Sheer panic alternately paralyzed and energized me. After a successful escape, I would wither at my front door - upon realizing he was now inside. Regular episodes of terrorizing delusions were destroying my last measures of security. I learned to effectively, though temporarily, numb the pain. Bashing my head and body on sinks and walls, cutting my arms... Peace eluding me, suicide became an option. After high school, I did find times of respite. I became accustomed to my peculiar experiences and worked around them as necessary. At 20 years of age, severe confusion and depression forced me to withdraw from social circles and from work. Debilitating fatigue had set in. Isolated again, I discovered a strange companionship in my own brain. It seemed to me I had two brains. I wondered whether they were two levels of consciousness, conversing with each other. When these chattered at an increasingly loud volume or fast note, I would beg them to cease. I could no longer control and direct my own thinking. I felt controlled. My brain was working with or without me. At times, my newly independent brain shut down entirely. No thoughts or images would occur. Therefore I was unable to either speak or move at times. I was terrified again. Other experiences included being invisible, floating and dissociating. I did not recognize my own face in the mirror, and my body parts detached themselves from my core... At the most debilitating point of my illness, I was barely able to lift myself from bed for three months. A shower, until I gave up on taking one all together, exhausted me, forcing me to sleep on the bathroom floor. After progressing to the point of eating one meal and bathing in a single day, I began to research. Eventually, a naturopath placed me on an anti-candida diet. Recovery! And three weeks later severe depression set in. For another year I battled hallucinations, (visual and auditory), persecutory delusions, resulting anxiety attacks and debilitating fatigue. Sudden changes occurred in my circumstances. I accepted a proposal to marry and moved to Ontario. Within a short time I was hospitalized for insomnia, severe depression and dissociative symptoms. I was diagnosed with Post Traumatic Stress Disorder and Adjustment Disorder. Drug treatment, after sleep became consistent, was deemed unnecessary and therapy was full-day group sessions. Regarding the diagnosis of adjustment disorder, I was assured by the psychiatrist that effective treatment would consist of ... getting a job! It had been determined that my recent move and marriage had rendered me shaken, and that employment would see me back to routine and its benefits. Three months after beginning day treatment I discharged myself and returned to work. In March, five months into my new job, depression became unbearable. I was started on Prozac. When unrelenting confusion, disorientation, delusions, and agitation were reported, my dosage was increased. My husband decided I was in need of more effective treatment and, convinced I would receive this at the Eric Martin Institute in Victoria, moved us there. I was to attend the 6B afternoon program for support and for observation. It was suggested I may have manic depressive disorder. One "expert", after a 10 minute interview, concluded I had Borderline Personality Disorder (BPD). The nurse present at this interview recommended I discontinue lithium and leave the hospital as it was "not possible for the hospital to treat a person with BPD," but that that person could only help himself! I later learned that more involved staff rejected this "expert" diagnosis. Severe agitation, a painfully heightened sense of hearing and violent (suicidal and homicidal) tendencies tormented me. I came to "understand" that my "mission" was to exterminate 2/3 of the world's population. I desired to destroy and I feared myself now as well as others. By the summer of 1995 I had wearied of the mainstream medical system. I was getting worse instead of better. Having had some success under naturopathic care, but knowing I could not afford to pay out for this alternative care even with the promise of reimbursement, I sought out a medical doctor with experience in naturopathy. I visited Dr. N. and described my symptoms. He asked a new variety of questions and I hoped his different approach would find a solution. Eventually he became confident of the cause of my difficulty. Diagnosis? Spirit possession! This was definitely alternative! Dr. N. assured me it was a good spirit, probably one of an individual who had died in a car accident or other traumatic circumstance. This spirit was likely confused, angry and unsure of his destination and was expressing this turmoil through me. The doctor could employ some assistance in calling on this one, and ultimately exorcising it. My personal beliefs prompted me to reject this notion and this doctor's care. I appreciated that at least he believed me and took my anguish seriously. It was at this time that a friend introduced me to Dr. Hoffer. On my first visit I was diagnosed with schizophrenia. Three weeks, five books and two "Our Club Outreach" worker visits later, I was convinced he was 'dead on'. Reading about schizophrenia was like reading my own journal. My husband and I were flabbergasted that this had not been recognized before. Dr. Hoffer started me on a drug called Etrafon D (two before bed) and of course, the orthomolecular treatment: sugar free diet, niacin and vitamin C. I felt so good after two weeks that I quit the program, believing my system had finally 'kicked in'. I relapsed severely. When my husband expressed his refusal to live with my psychotic behavior, I found my incentive to pursue effective treatment. I immediately started on the vitamins and Etrafon D and a week later, after further study, began an elimination diet (October, 1995). I have been well since then, except for three brief psychotic periods, two after eating chocolate and another at the time of a flu virus. I am certain of what has treated me. It is both the elimination of allergens plus the vitamins themselves. (I stopped the drug Oct. 1995.) I am, for the first time since my preteens, relaxed, calm, stable and energetic. I am able to concentrate, converse and read without a "second brain's" interference. I am no longer forced to rely on a day planner to remind me to eat, to bathe, to sleep, to rise. I do at times continue to experience some physical symptoms of ill health. I believe these to be allergy or yeast related and am confident Dr. Hoffer and I will resolve this with further orthomolecular treatment. Presently I am doing volunteer work and pursuing paid employment in the health care field. My husband and I are in the process of implementing our shared long term goal of relocation to Latin America, where we hope to live, work and volunteer. I am ecstatic to report the positive results of orthomolecular treatment in my case. I know orthomolecular treatment to be essential in not only providing effective remedy to various forms of disease, but in rekindling hope, focus and determination where there may be none. Orthomolecular treatment does insist that an ill person exercises patience, discipline and consistency, but based on my experience I feel I can definitely assert that it is well worth the effort." December, 1995. I am visiting with my family. My mum, who was appalled at the sight and observation of me in August, has written to my brother that I am now "looking and feeling great." I'm already excited about getting back to Victoria to put my work plans to the test in January, but it's so good to be here again, actually able to enjoy friendships again for the first time in a year and a half. Thanks for all your help and encouragement. Not only am I well, I am thrilled with the prospects of helping others effectively as a direct result of my own experience. Thank you for the option of health. 1. An antifungal medication used to treat Candida infections. 3. A combination of an antidepressant, Amitryptiline 25 mg and a tranquilizer, Perphenazine 2 mg.
4. Hoffer A, Kelm H & Osmond H: The Hoffer-Osmond Diagnostic test. RE Krieger Pub Co. Huntington, New York, 1975.Test kit available from Behavior Science Press, 3710 Resource Dr., Tuscaloosa, AL 35401-7059. A software program is available from Soft Tac Enterprises, 1181 Union Rd., Victoria, Canada V8P 2J2, (604) 384-0342.